Many cultures have very specific foods they eat on New Year’s Day, foods that are believed to put the odds in your favor for a wonderful year. So, if you’re superstitious, or don’t want to tempt fate, or just want to eat some delicious and healthy food, please read on! As I gathered information, digging through recipes and stories about these traditional foods, a pattern emerged. Certain humble ingredients are likely to lead you to a year full of wealth and good fortune. And though each culture’s final dish was different than another’s, the basic building blocks were the same. Leafy greens (kale, chard, collards): Represent economic fortune as the greens are thought to resemble paper currency. Legumes (beans, peas, lentils): Also represent economic fortune; the tiny round legumes are symbolic of coins. Pork: Full of flavor and fat, eating pork signifies wealth and prosperity. When living in Virginia and North Carolina, my family and I always ate Hoppin’ John on New Year’s Day. Hoppin’ John is a traditional southern one-pot meal made with black eyed peas, rice, and pork (bacon, ham hock, or fatback). We served it with greens on the side, usually collards. This year, after all the indulging between Thanksgiving and Christmas, my body needed a major reboot. Instead of Hoppin’ John for New Year’s Day, I tried something new. 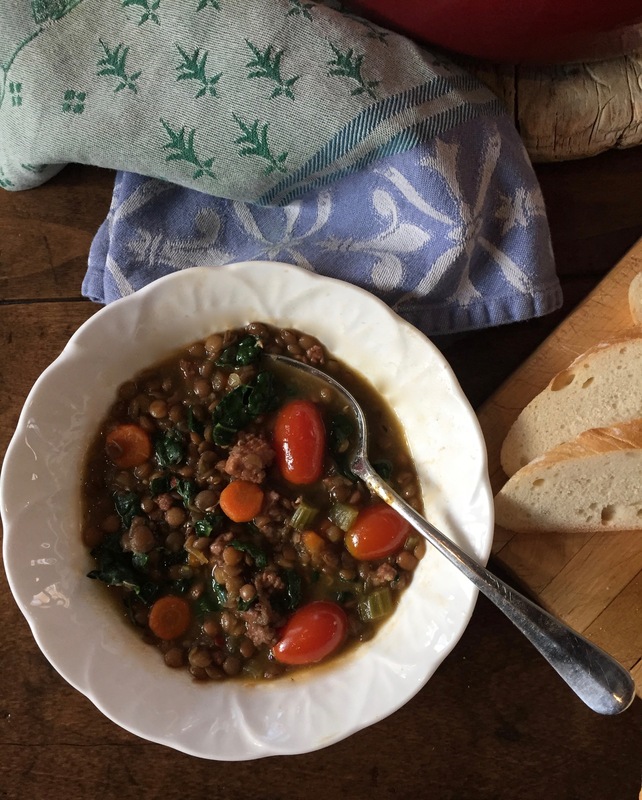 Using the same overall game plan… leafy greens, pork, and legumes, we kicked off the year with Lentil Soup with Sausage and Kale, healthy, but still full of good luck. Yes, I know there’s sausage in there, but really- it’s not a lot, less than 1oz per serving. 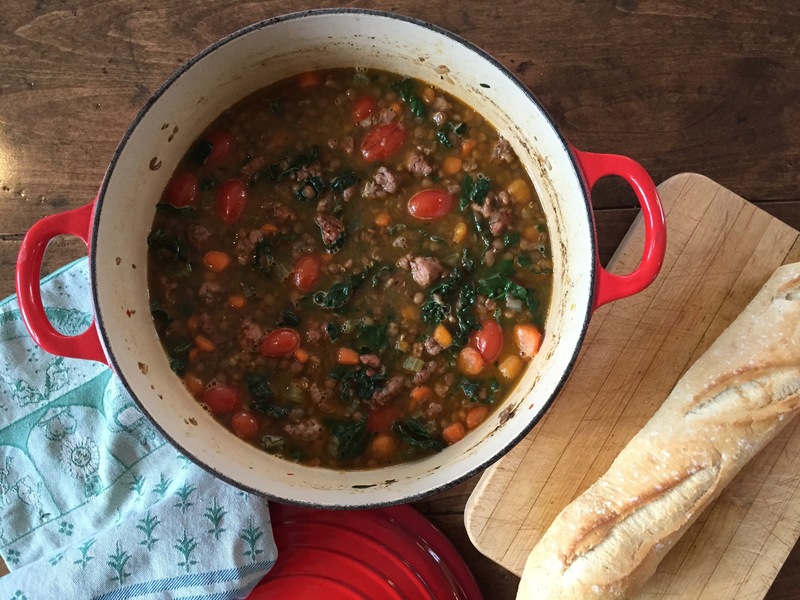 While the pork and kale will provide additional good fortune for the year, they are not necessary for the recipe. 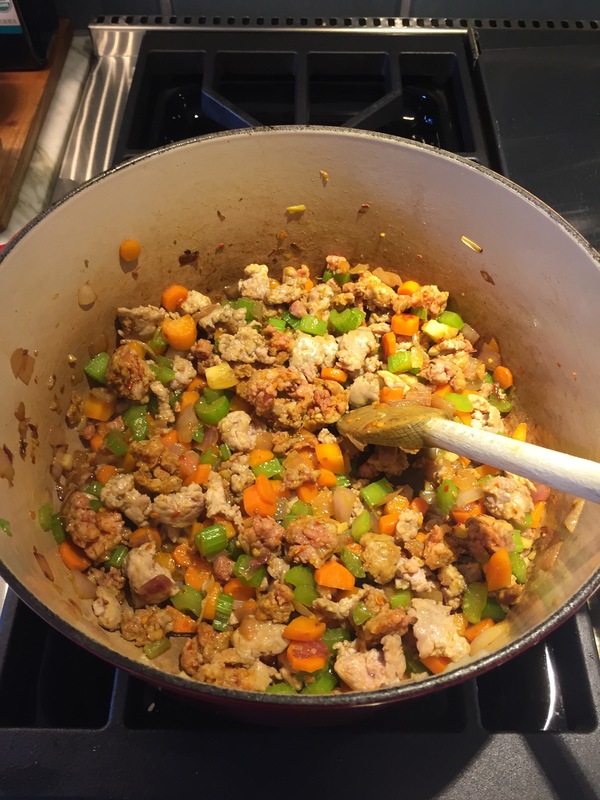 If you don’t want to add the sausage, don’t, but then do bump up the flavor by adding more garlic and other spices such as a bit more thyme, and perhaps red pepper flakes. Or maybe bacon or cubed ham steak is more your thing; either would be delicious. If you prefer a different green, try spinach. How about no greens? Add a bell pepper or turnips to the vegetable mix. 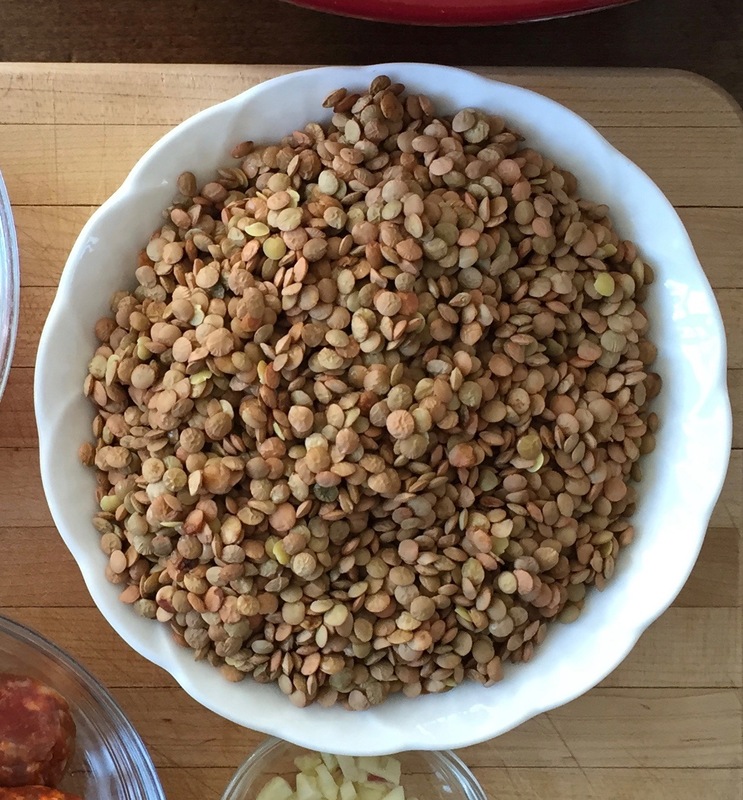 Hoppin’ John, a very special dish full of flavor and memories of our time spent down south, will remain in my arsenal of recipes, making an appearance once a year. On the other hand, this soup will be now be part of the regular rotation. Perfect for dinner with warm crusty bread, even tastier the next day for lunch at home or sent in a thermos to school or work. And who couldn’t use some help ensuring prosperity throughout the year, not just at the start?!? I wish all of you a year full of health, good fortune, and delicious food shared with those you love! In a dutch oven over medium high heat, warm olive oil. 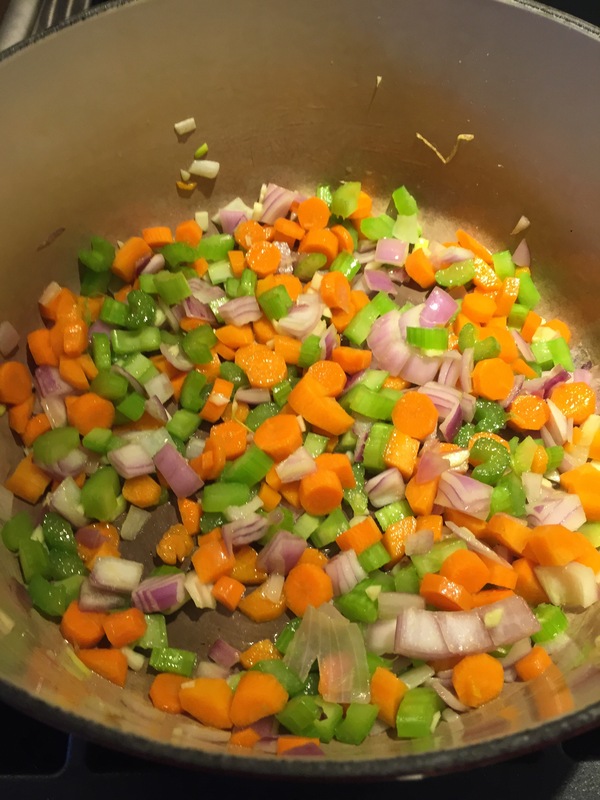 Add carrots, celery, and onion. Sauté vegetables for 5 minutes or until just tender. Add garlic and sauté for 30 seconds, until fragrant. Add sausage, breaking meat up as it browns. When sausage is cooked, stir in tomatoes and lentils. Add water, bay leaf, and thyme. 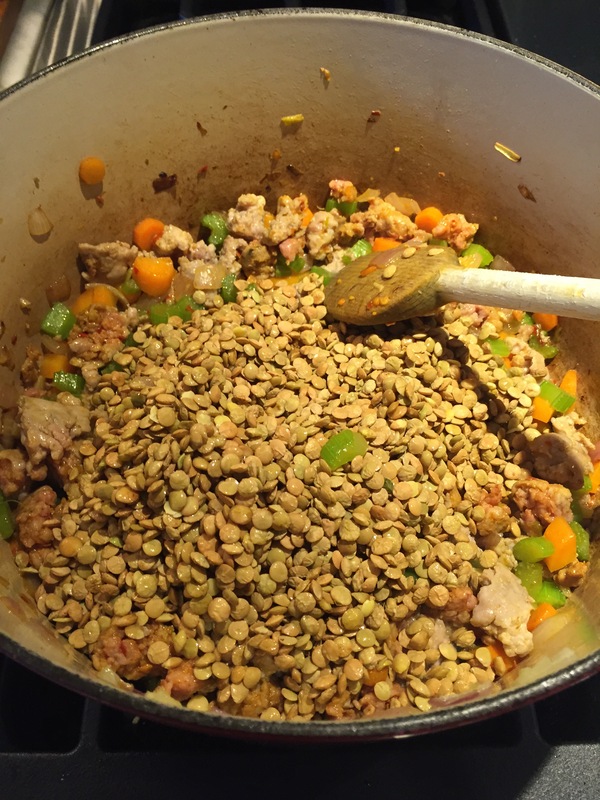 Bring to a boil, lower heat and simmer for 45 minutes-1 hour, until lentils are tender. 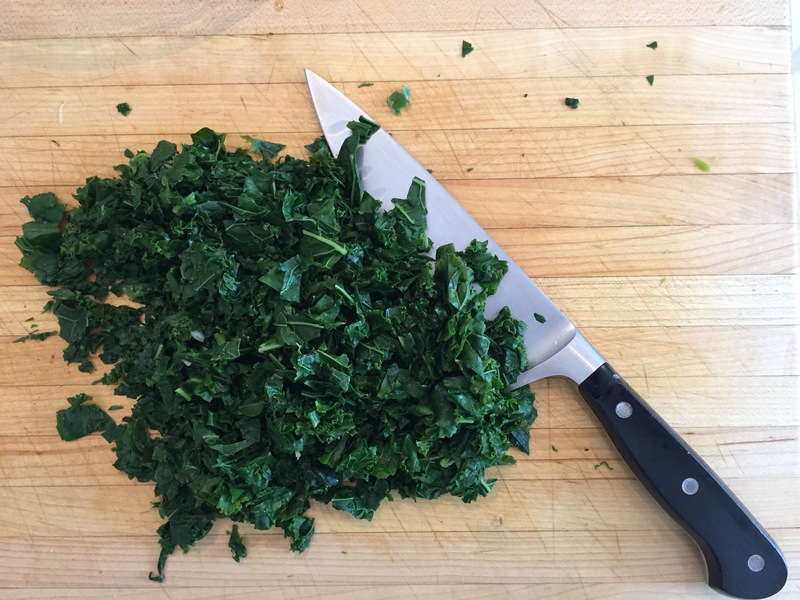 During last 5 minutes of cooking, stir in chopped kale. Check seasonings, adding salt and pepper to taste. Serve with crusty bread. 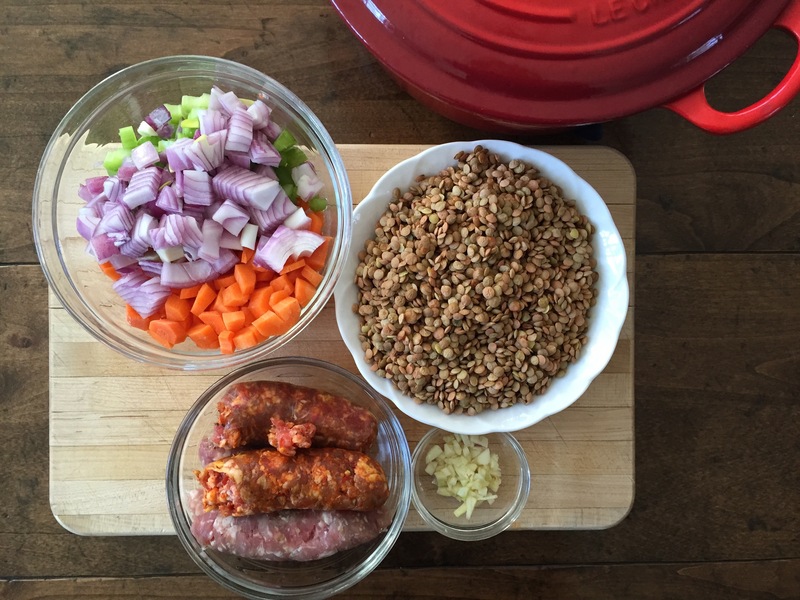 The basics of lentil soup… carrots, celery, onions, garlic, sausage and lentils. The spices, kale, and water are waiting on deck. Sauté vegetables for 5 minutes, or until just tender. Add the sausage, breaking it up with a wooden spoon as it cooks. Add the green lentils (and tomatoes) if using, stirring them into the sausage mixture. I forgot to add my tomatoes at this point, but remembered and added them while the soup was simmering. Throw in a bay leaf and thyme. 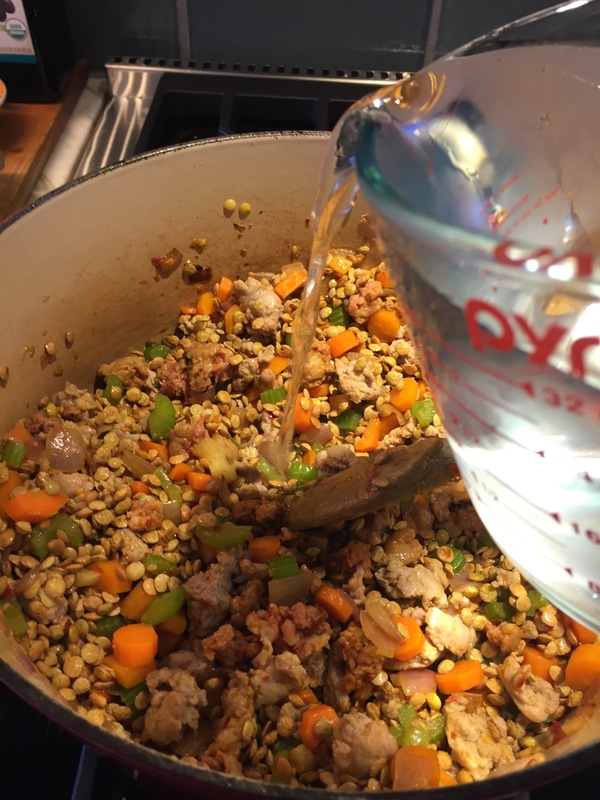 Add 8 cups of water to the sausage, vegetable, and lentil mixture. 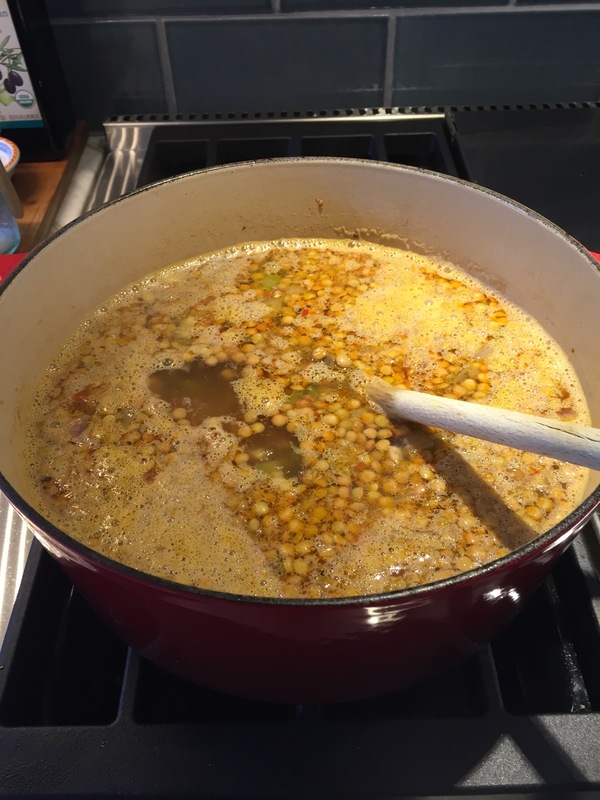 Bring soup to a boil, reduce heat and simmer for 45-60 minutes or until lentils are tender. About 5 minutes before the soup is done, add the chopped kale. Continue simmering the soup until kale is wilted, about 5 minutes. Season to taste with salt and pepper. The soup looks really good!..I love the ingredients used! That soup is so beautiful I almost feel healtheir reading and looking at it. Full of such good stuff. 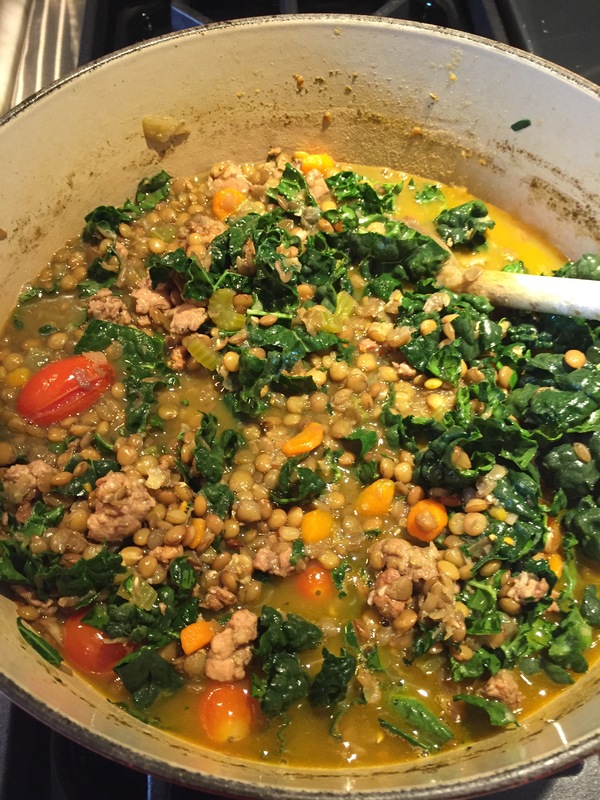 Lentils are such a perfect food and I love how you added sausage and kale. Delicious. Thank you, Suzanne! Trying to kick off the new year with healthy food and good luck. Thanks so much for stopping by and the lovely comment! this sounds healthy and very delicious! I love lentils. I am looking for things to make when and if I go to work one day haha so this is great and I think I could make this at night for the next day! Lynn, it is even better the next day, and the next…! My daughter had some for breakfast this morning! I make a very similar soup but have never added carrots. Definitely going to give that a try! There are so many different directions you can take this soup. Add different vegetables, leave out the meat, or change up the spices. Whatever is in the pantry and suits your taste! The soup looks lovely and hearty, and full of wonderful ingredients. You’re right about needing to reboot our systems after the excesses of Christmas, and your soup looks like an ideal recipe to include in our ‘healthy eating’ programme. And, as you say, it can be made in a variety of ways. Happy New Year to you, Jean. This is the first time I’ve been on your blog since before Christmas to wish you that! Happy New Year, Millie! I really didn’t post anything between Christmas and New Year’s, instead I just ate and had a few cocktails, then ate and had a few more cocktails, with some chocolate bark and candied nuts sprinkled in for good measure. Hence, the reboot! 😉 Definitely missed seeing you and am looking forward to lots of visits in 2016! I didn’t post between December 22 and January 1 either – far too much eating and drinking to be done! I’ve been trying to play catch up, but it’s almost impossible with people who post several times a day! Good to hear you had a great Christmas, anyway. Let’s see what 2016 brings. Yum! I love lentils but haven’t made a soup of them in years. The sausage sounds like the perfect pairing, I may have to pick some up tonight! Thank you, Mary! 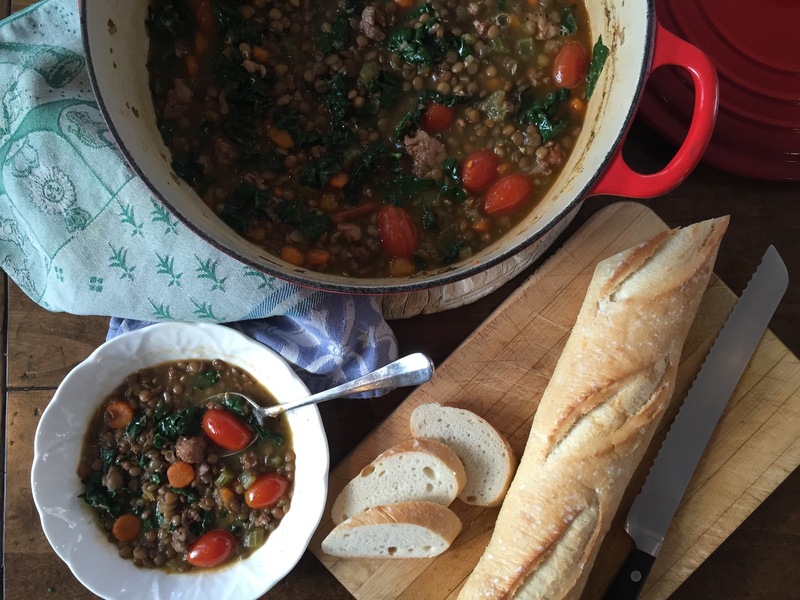 This lentil soup is perfect for chilly nights (and days!). Hope you give it a go! 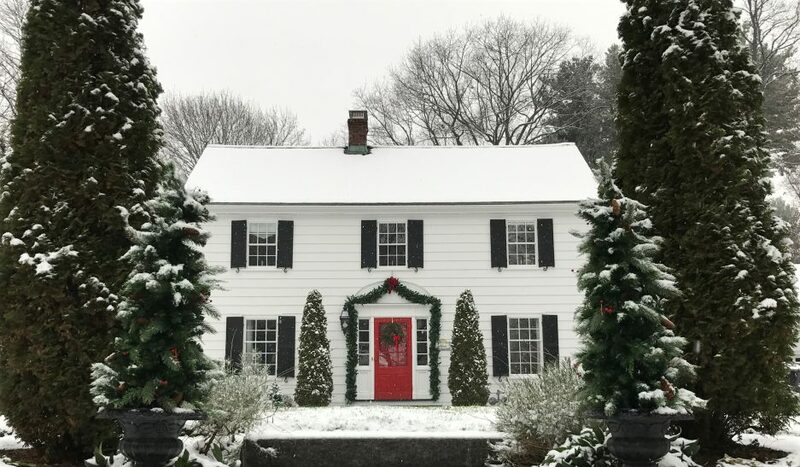 Delightful photos & recipe, Jean! I was in search of a lovely lentil soup! Thank you! Thank you, Lana! Hope this one is a keeper for you!